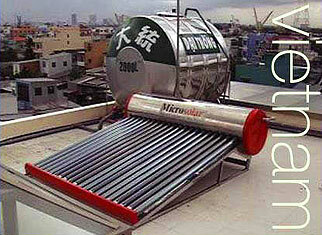 with a Microsolar M80VTHE 360 litres Coaxial Multivalve Thermosyphon Solar Water Heater. Outside air temperature 7 deg C. Period of test April 2005. 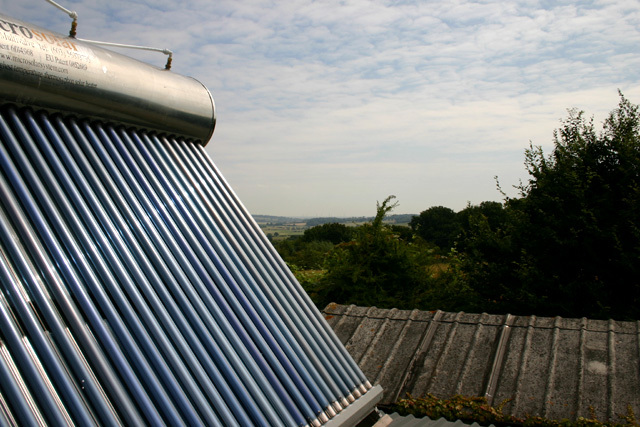 Consumers in the United Kingdom can now enjoy substantial savings on their electricity bills on central heating and hot water with a new, affordable, state of the art Microsolar Coaxial Multivalve solar water heater. 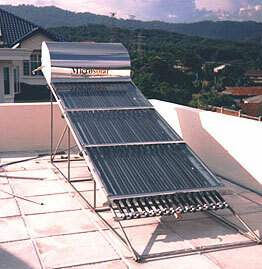 What first germinated in 1980 as a nascent idea for part of a Honours thesis by a Malaysian architecture student at Edinburgh University has, after many years of research and testing, in 2005 culminated in the state of the art Coaxial Multivalve Thermosyphon Vacuum Tubes Microsolar Water Heater, the most efficient thermosyphon solar heater in the world today, now on sale in the UK. 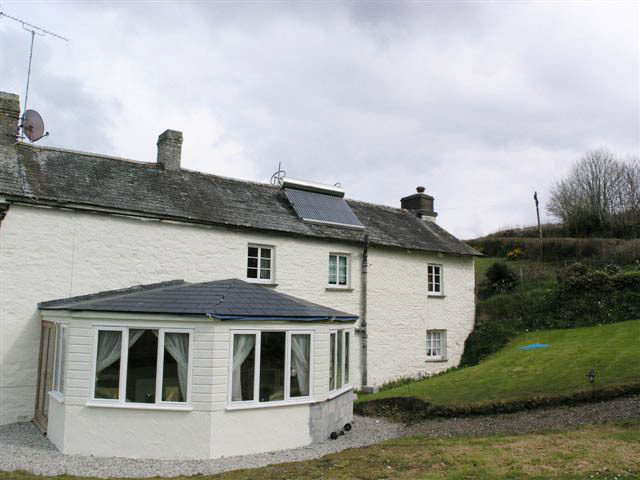 In a large farmhouse at Lostwithiel, Cornwall, England, heating oil savings of 90% were reported when the Microsolar heating system was used compared with the existing heating oil powered central heating system. 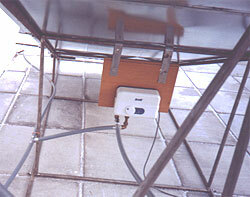 The electric immersion heater in the Microsolar was not used at all. Even if the immersion heater was to be used partly in the winter the client Mr. Rowe estimates that the heating oil savings during the winter will be 50% leading to an overall yearly savings of 70% to 75%. The client is very happy with the excellent results and the payback period in the region of 1 to 11/2 years. 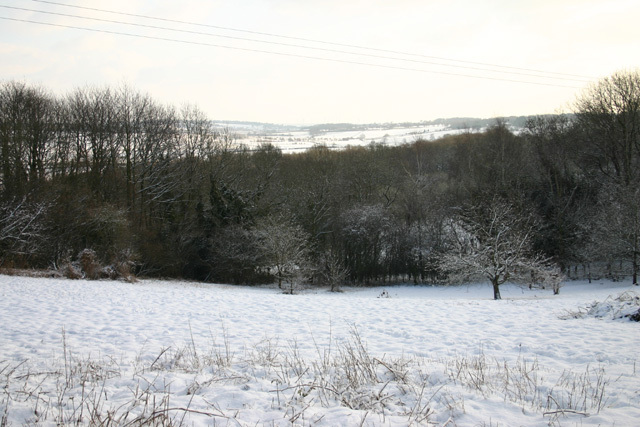 In his opinion the Microsolar can guarantee hot water at a fraction of the cost of any other water heating system including any other solar panel in the market, even under the cold damp, cloudy conditions prevalent in England. 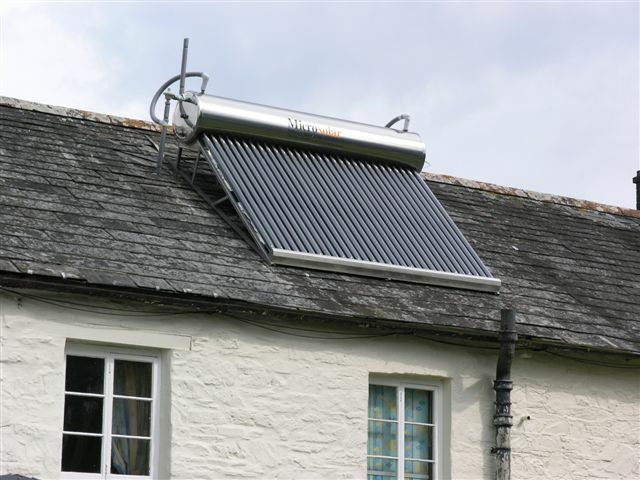 Microsolar Water Heater M80VTHE 360 litres being used for central heating on a large farmhouse in Lostwithiel, Cornwall, England. It is saving 90% of oil central heating costs. 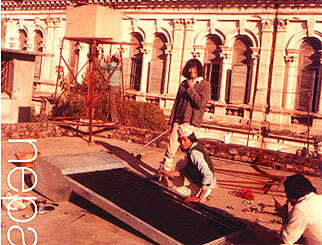 With a Microsolar M60VTHE 264 litres Coaxial Multivalve Thermosyphon Solar Water Heater. 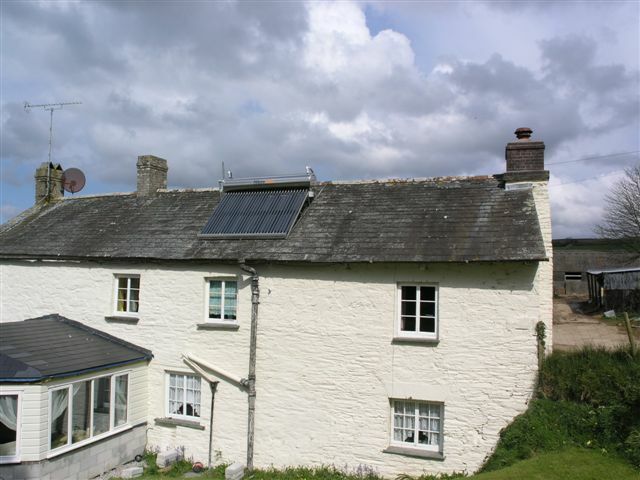 On another farmhouse in Cornwall England, 80% of oil savings were reported when the Microsolar was used for domestic water heating for the showers and kitchen. 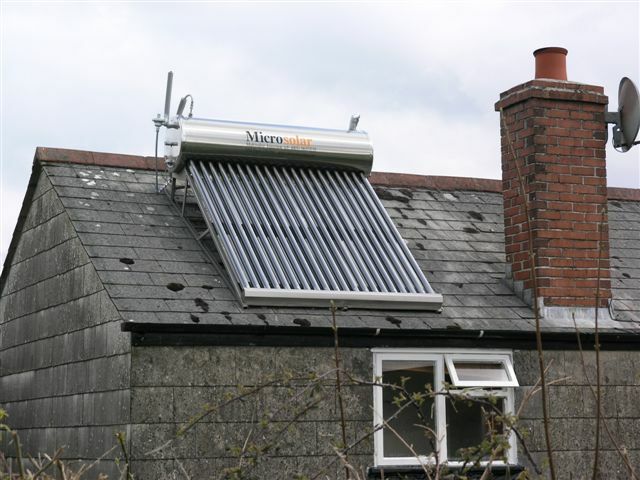 The Microsolar was connected into the existing indoor 3 kw immersion heater tank. The immersion tank temperature was 70 C but it only held 25 gallons but when it was connected to the Microsolar the water temperature stayed hot for 60 to 70 gals. When the water in the immersion tank was drained off it took an hour to reheat with electricity (high cost with the existing 3kw immersion heater) and then only 20 to 25 gals are reheated. But when the Microsolar M60VTHE was connected to the indoor 3 kw immersion tank the water was a lot hotter (no mixing of cold incoming with hot water at the top of the immersion tank) as the water from the Microsolar was already hot. If on an overcast day, the water in the Microsolar was 40 C and the water in the immersion tank had to be 70 C, it only took approx 10 mins of 3 kw electric heater to bring the temperature up to 70 C thus saving 80% of power to heat water and that is in April with an outside temperature of 7 C. As the weather warms up for summer the client estimates that savings will be nearer 90% to 100% and in the winter the savings should be 50%, so overall the yearly savings on domestic hot water electricity bills should be 75% to 80%. As the other customers have mentioned, the British people would want a guaranteed hot water supply in the winter and now they have it, and it is very inexpensive too. How does the Microsolar work so efficiently in overcast damp conditions when other solar panels cannot function? The secret is in the patented coaxial multivalve connections between the solar collector tubes and the hot water storage tank. These Coaxial Multivalves overcome the bottlenecks and restrictions inherent in all other forms of thermosyphon solar heaters. The Microsolar eliminates all horizontal flow in the thermosyphon circuit by doing away with the horizontal manifold commonly found at the top of the conventional single valve thermosyphon solar water heater collector panels. Thermosyphon or convection flow needs a gradient to operate, and horizontal pipes stagnate or kill off the thermosyphon flow. Microsolar Solar Water Heaters (EU Patent 0852689B1, Teoh) are the only (legal) Coaxial Multivalve Thermosyphon Solar Water Heaters in the world and they are the world’s highest temperature thermosyphon solar water heaters. They can operate in Negative 32 C conditions without freezing, without any chemicals, using only tap water, and without any form of supplemental backup heating. In sunny conditions the maximum water temperatures attained (in Spain, for example) for 270litres is 12 C to 100 C (boiling point) in six hours of sunshine, these extremes of performance are unmatched by any other thermosyphon solar water heater today, even by other (non coaxial) vacuum glass tube solar heaters. The inventor Mr Siang T. Teoh of Malaysia graduated First Class Honours in Architecture from the University of Edinburgh in 1980 and was awarded the prestigious Rowan Anderson Prize as top architectural student in Scotland in 1980 by the Royal Incorporation of Architects in Scotland for his work in solar architecture. He was awarded one of four worldwide recipients of Time Magazine’s Heroes of the Planet - Design in 1999 for the design of the Coaxial Multivalve Thermosyphon Microsolar Water Heater. 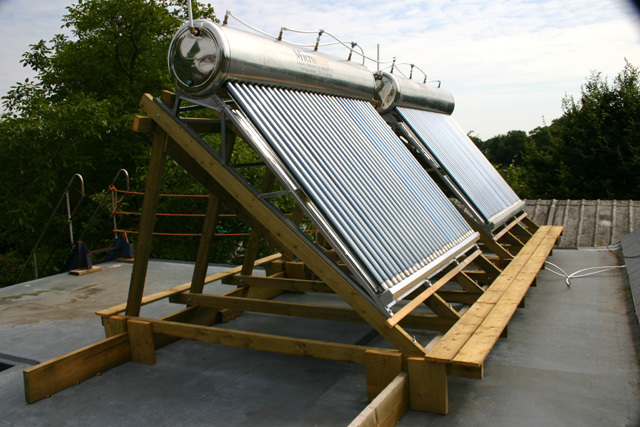 And now, after 25 years, the Coaxial Multivalve Solar Heater has come back to the United Kingdom where it all started. 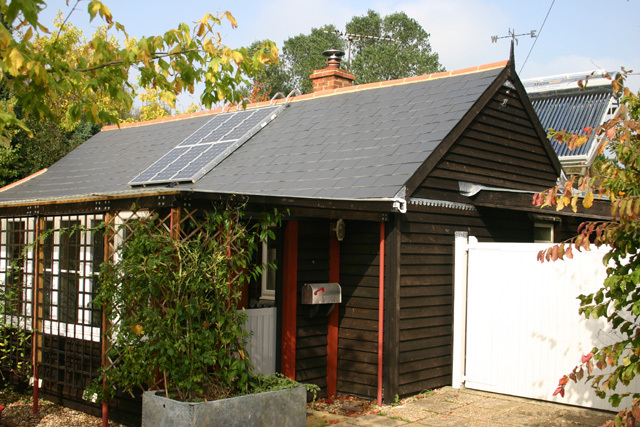 Microsolar stand alone water heaters on a farmhouse in Sussex, England. In the distance are windturbines under construction. Photos by Alan Bridgewater. 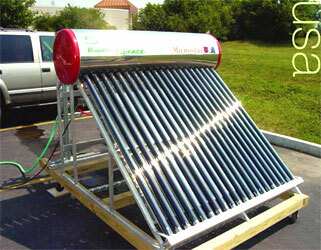 Vacuum tubes solar water heater undergoing testing at Microsolar USA Wisconsin Headquarters at Pewaukee Wiscosin May 2003. Max temp 87.8°C 190°F in July 2003, the highest temperature ever achieved by any thermosyphon solar water heater of equivalent capacity and collector area in the USA without electricity. 150 Litres, 11 Valves prototype multivalve solar water heater. Help save the environment with Microsolar's latest generation Multivalve solar water heaters that do not require any backup electric heater.